PanARMENIAN.Net - Sunderland are taking a look at Armenian international Gael Andonian. The former Marseille man is a free agent and is training with the club’s under-23 side with a view to earning a contract with the Black Cats, TBR says. The 23-year-old featured in the under-23 clash with West Brom recently and will remain with the club over the international break, after losing his place in the Armenia squad. 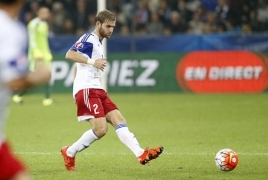 Andonian may represent Armenia, but he was born and raised in the city of Marseille. He joined the club at aged nine and only left the club this summer. However, in all that time, he played just one league match for the club. Andonian will now hope he can find a way to earn a contract on Wearside.